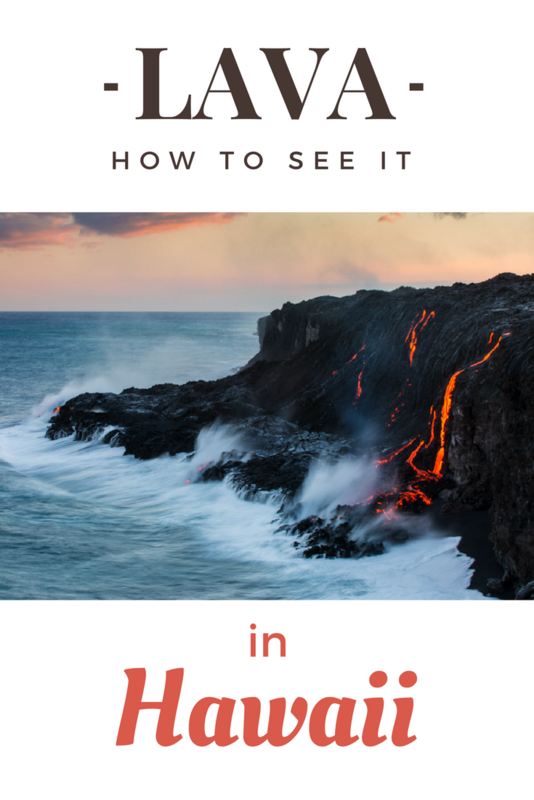 How to see lava on Hawai'i Island right now | Tracie Travels The misadventures of a restless photographer. Travel photographer and travel blogger, Tracie Howe, wanders the globe seeking out new adventures and photo opportunities to blog about. Join her for a unique perspective on travel, travel photography, and travel tips. 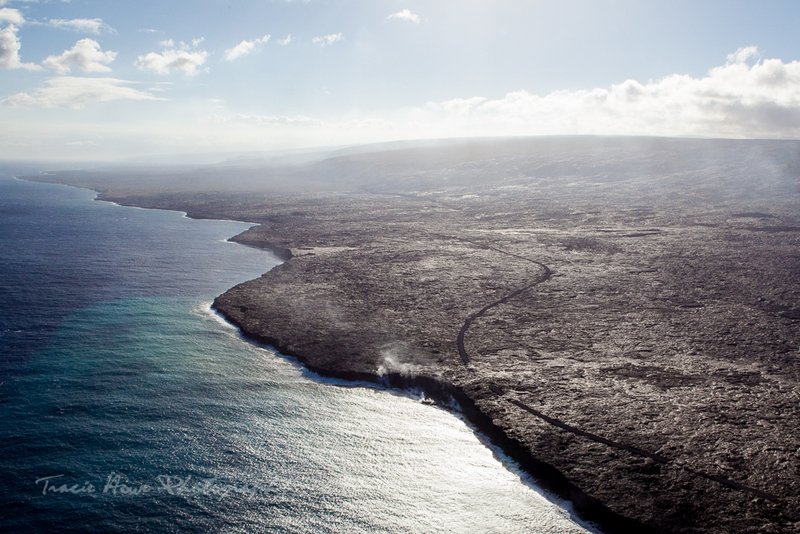 If you’re at all familiar with Hawai’i Island, you’ll know about it’s biggest claim to fame – volcanoes! Many years ago when I first visited the island of Hawai’i (also known as the Big Island) with some friends, we attempted to see the lava flowing into the sea. We walked on jagged solid lava for miles, which is not an easy task. Unfortunately, our only reward was spotting a speck of red, glowing in the distance. Ever since then it has been my goal to really get a good look at lava. It was my latest trip that made this dream a reality and took me closer than I ever imagined was possible. After my previous experience on the Big Island, I was so determined to get a good look at lava this time that I arranged to see it by land, by sea, and by air. 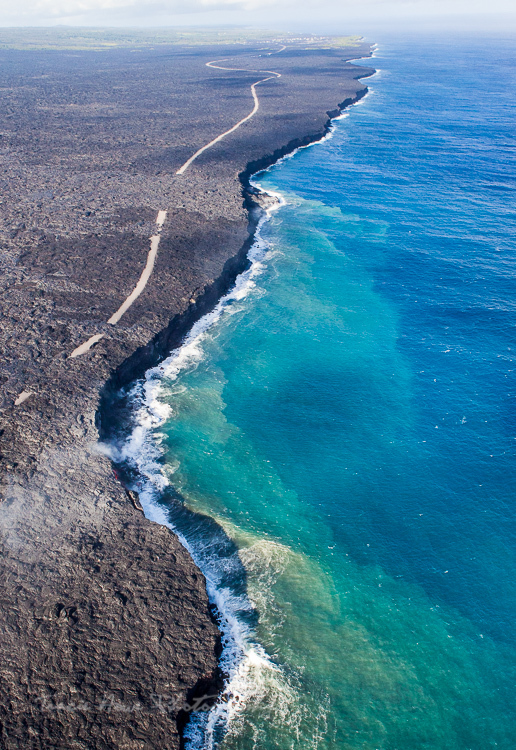 I was also fortunate with my timing, because just a few weeks before my visit, the lava flow connected once more with the ocean. This is the first time in three years! 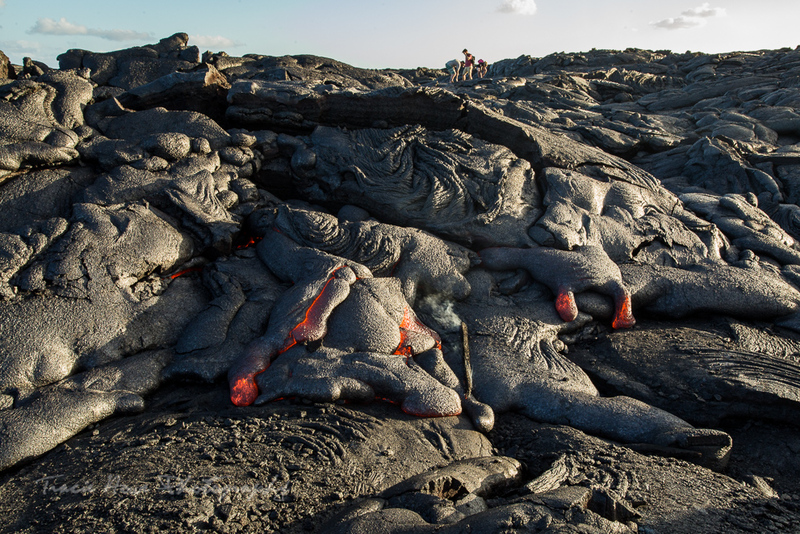 So here I will share those experiences and how to see lava on Hawai’i Island for yourself. Now is the time to go! Be sure to read the end of the post where I provide valuable travel and photography tips for these activities! Trust me, you’ll want to be prepared! My first adventure seeing the lava was an exhilarating introduction by air. 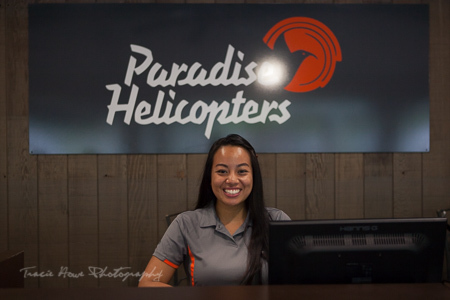 Paradise Helicopters offered me a spot on their Volcanoes & Waterfalls Extreme flight. The extreme part refers to the fact that there were no doors on this helicopter! I never even imagined that this was an option, but I was so excited when they offered it to me! The major advantage for photographers is that there are no reflections on glass to worry about. As a bit of an adventure junkie, having no reflections was simply a bonus for me! 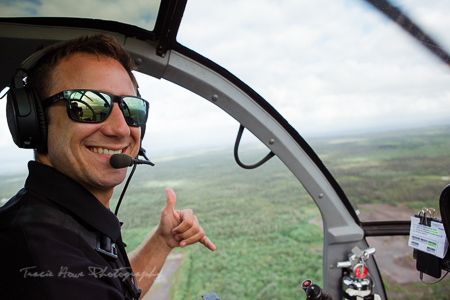 The flight started off at Hilo’s tiny international airport. As we lifted off, I felt a smile spring to my face. This was going to be exciting! Despite the adrenaline flooding my veins, I did my best to focus on the landscape below. 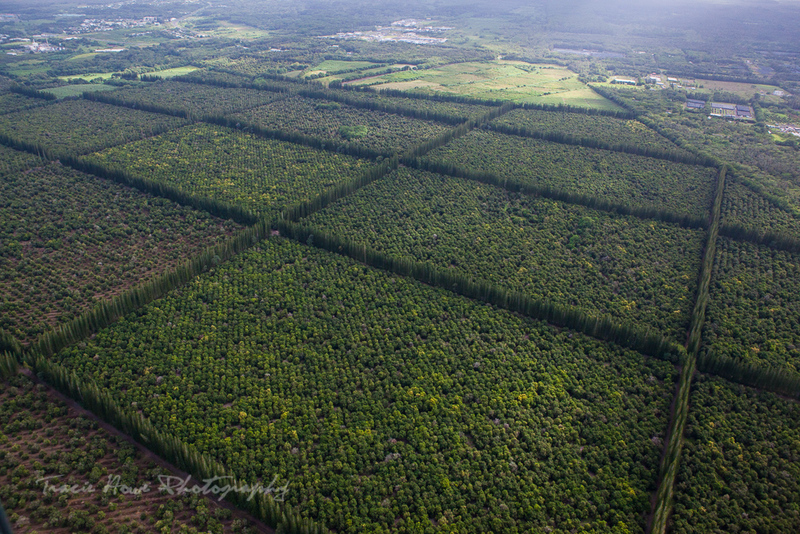 We first flew over various Hawaiian crops, then lush clumps of trees. Soon, the scene became stark and black when we encountered the dry lava fields near the caldera of Hawaii Volcanoes National Park. 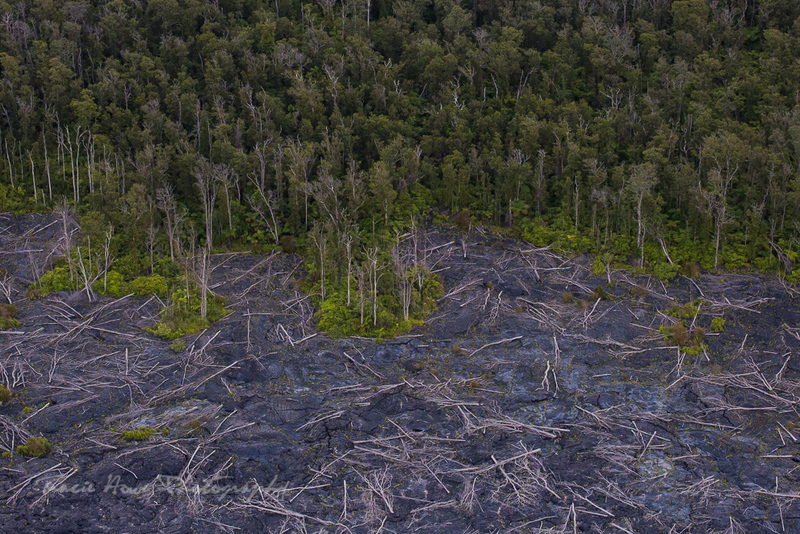 Some trees were felled and lying on their sides while others survived in small islands surrounded by lava. Tiny gaps in the lava made themselves visible with the steam they emitted. As we got closer to the crater, we could see a big cloud of steam rising. 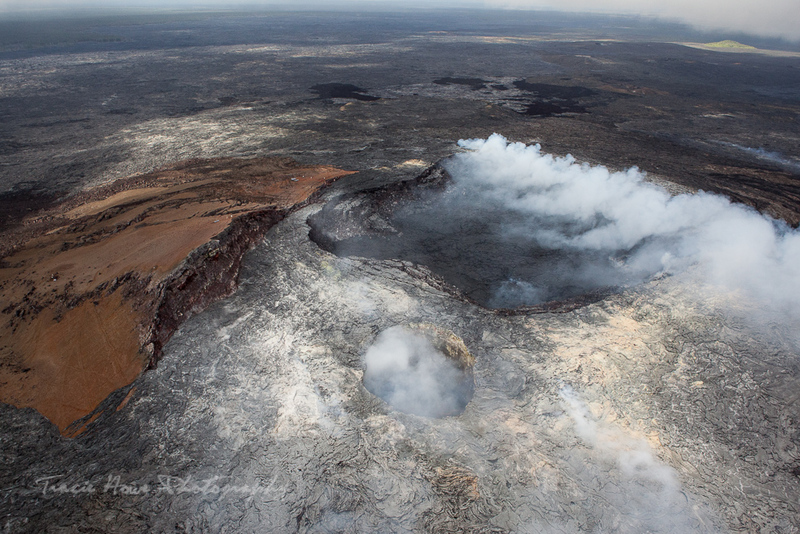 Our pilot maneuvered over various holes in the earth, pointing out the rivers of lava beneath. We circled the caldera which contains a giant lake of lava. 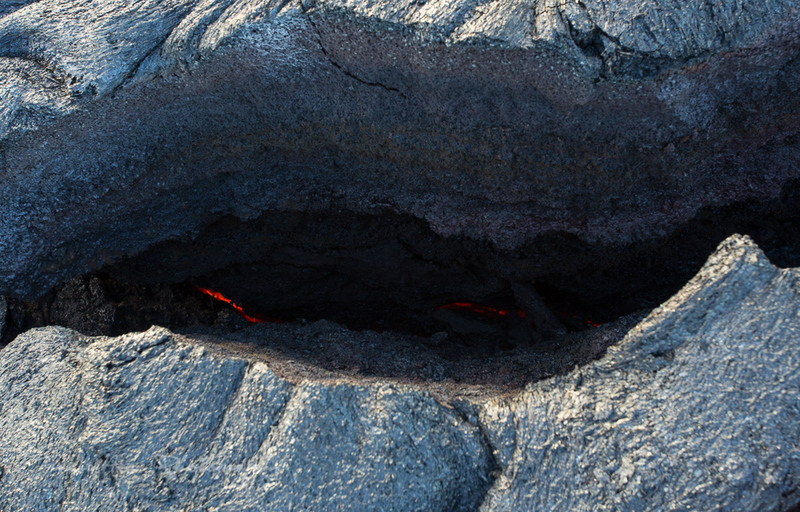 The surface is mostly black where the cool air tries to dry the lava. Lines of red reveal the hot magma just below the black surface, much like cracks on top of a bread loaf. From there we were flown toward the recent lava ocean entry point. 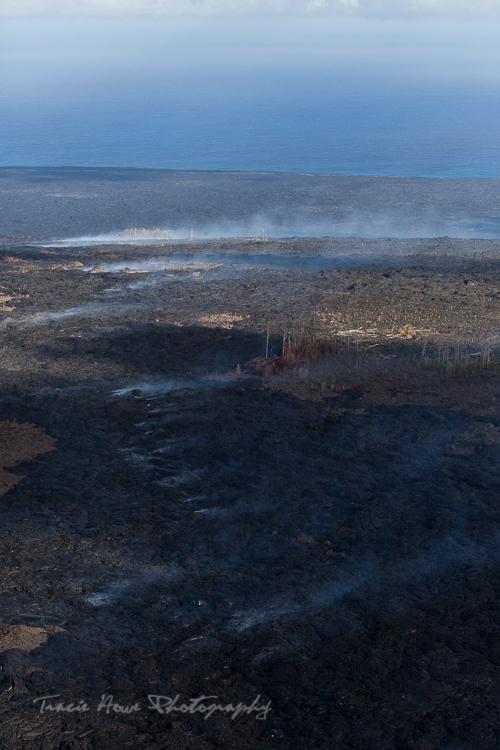 We began to see the devastation left by this particular lava flow leading all the way to the ocean. Steam rose from the ocean entry point, showing us exactly where the lava was going to appear at the water’s edge. 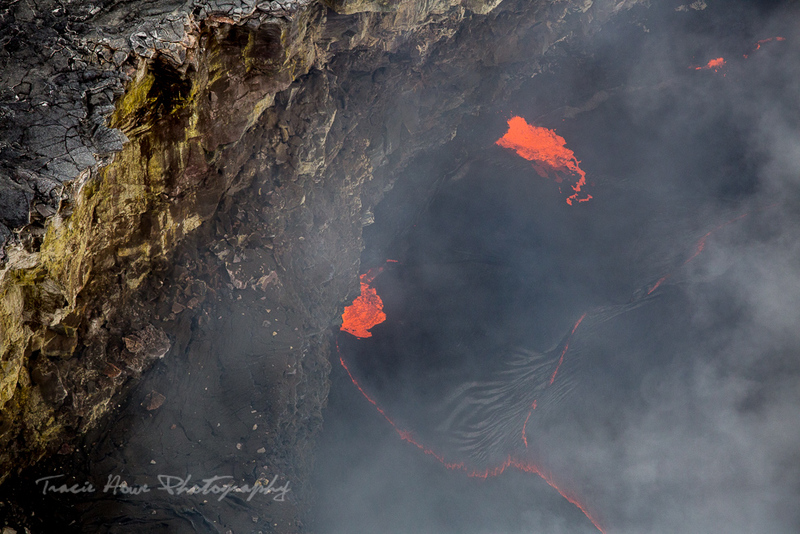 The lava dripped into the ocean like a red-orange waterfall, a striking contrast against the black lava rock. Our pilot circled the area several times, giving each of us equal opportunity for photos. This stark, black landscape lined by the beautiful aqua blue waters was a spectacular sight to behold. The sheer magnitude of the devastation can not be fully appreciated without seeing the scene from above. 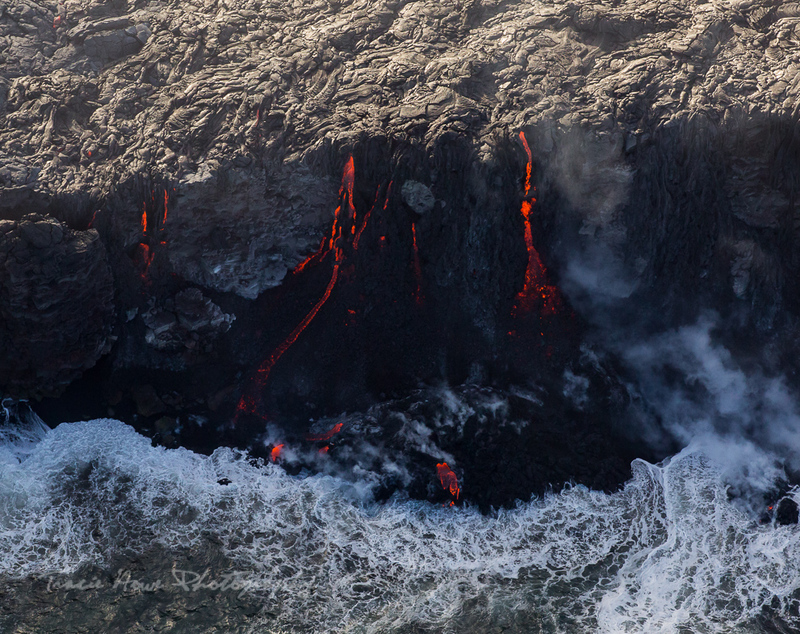 Of course, this extreme helicopter tour included more than just lava. 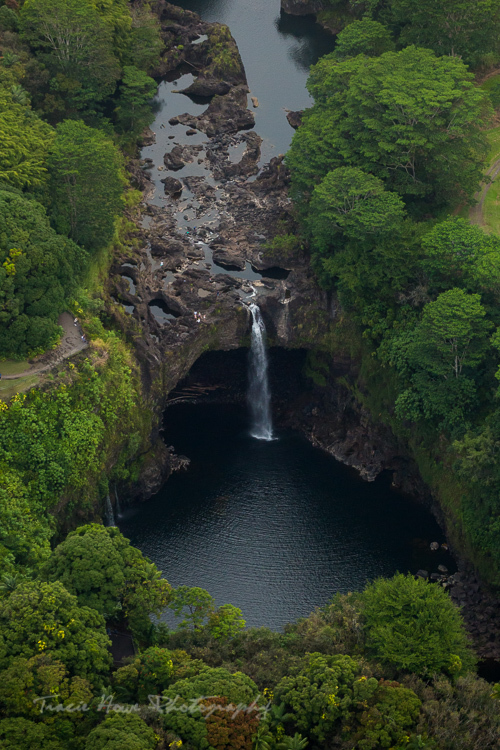 We ended the trip by flying over Hilo’s Rainbow Falls. I was glad to see it by air at least, because I wasn’t able to see it by land due to my limited time on the island. It was impressive, even at a distance and through a veil of light rain. Next time I visit, I’ll be sure to see it up close! My next encounter with lava was just a hint of what was to come. 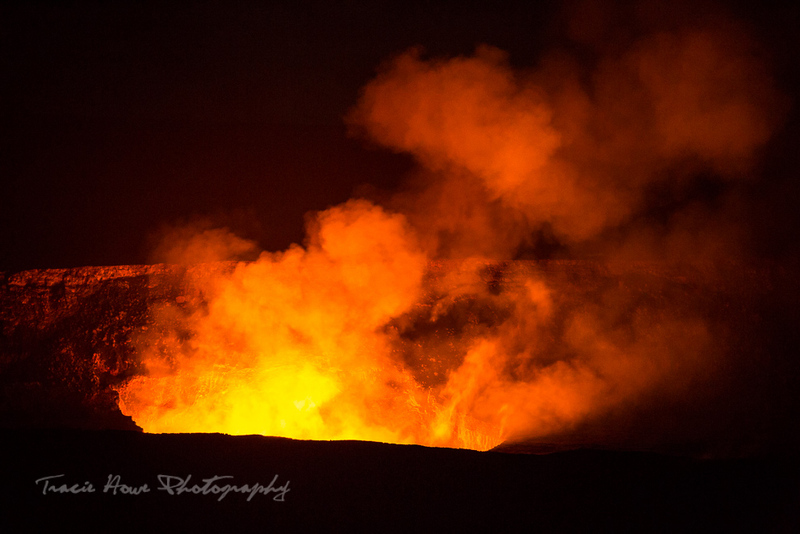 I went to Hawaii Volcanoes National Park at dusk to photograph the caldera from the Jaggar Museum viewpoint. Me and about a hundred other people. I honestly don’t know what this spot looks like during the day, but I know the real show happens at night. 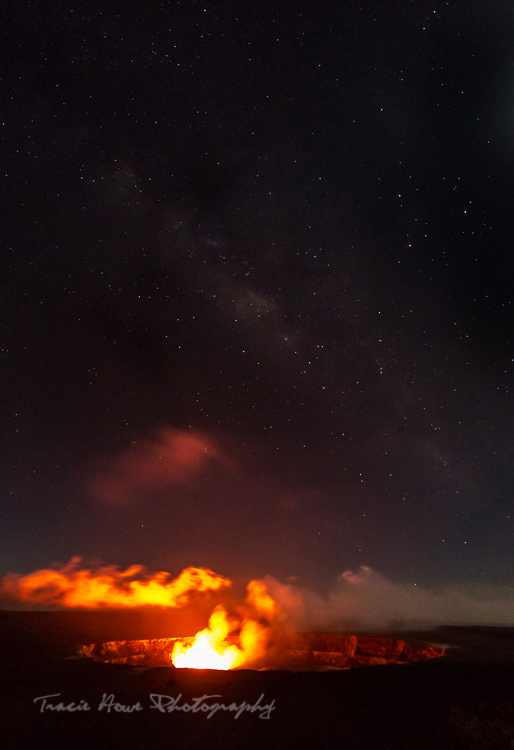 From Hawaii Volcanoes National Park you can see the glow from the lava lake at night. 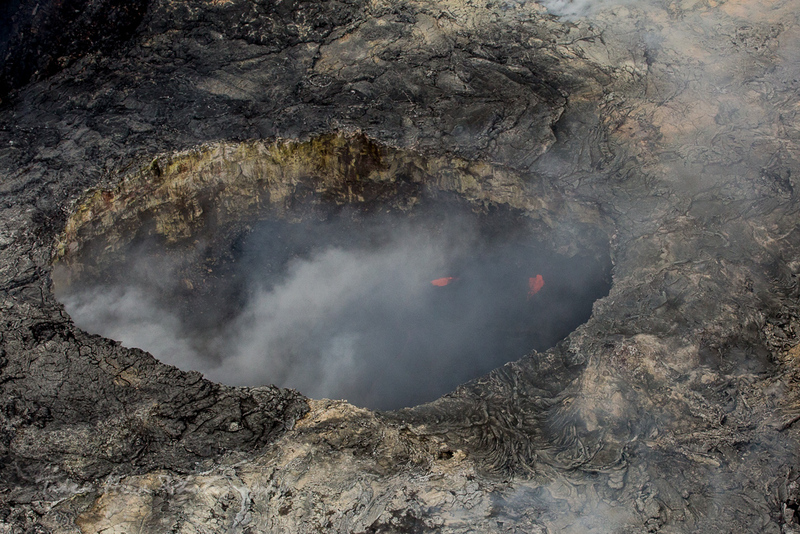 The steam arising from the massive hole in the ground reflects the color from the lava lake. If you’re really lucky, the lake may rise enough for you to see the lava itself. Even just the steam reflecting lava is an impressive sight at this distance! As usual, I timed my trip horribly for star photography, but I did manage to capture a faint MilkyWay lined up with the caldera. 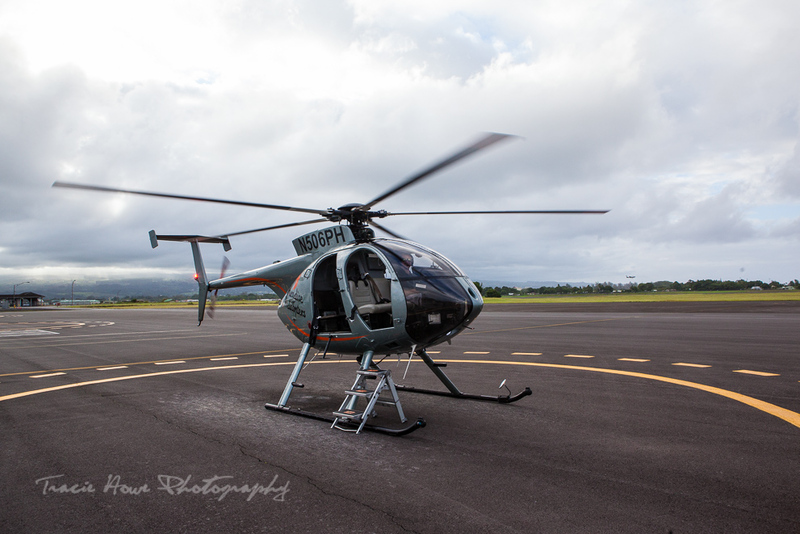 It was actually the helicopter flight that eased me into my next lava adventure. From the air I could see the road where my lava approach by land would be. Up until then I had the impression that the approach would be almost entirely on old lava fields. My research warned me that the hike was long and tiring, and that I would need to be very careful around fresher lava. 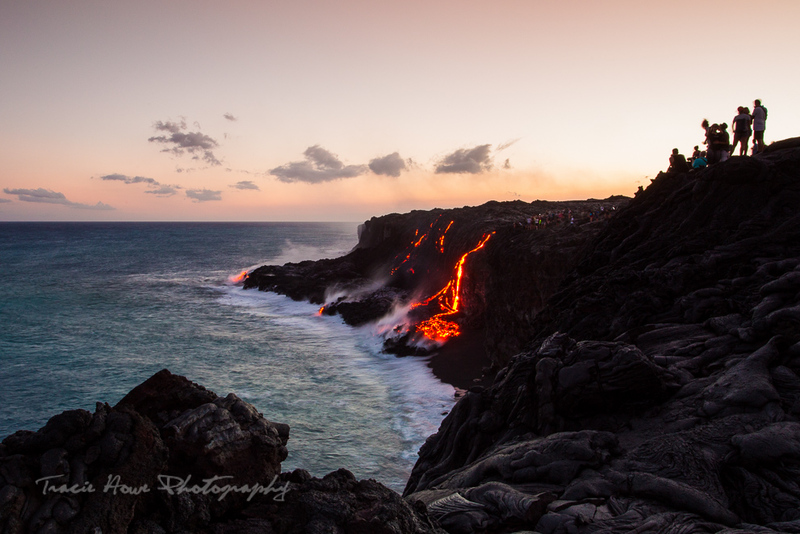 I planned to photograph the lava ocean entry during and after sunset, so I knew that my return would be at night. I imagined something like my first experience on the big island, with the added danger of walking over freshly dried lava in the dark. Fortunately, my helicopter tour gave me the added benefit of seeing exactly how much lava I would need to cross in the dark. It wasn’t nearly as much as I had expected, so that knowledge made me less apprehensive. This is the end of the gravel road that I spotted from the sky. 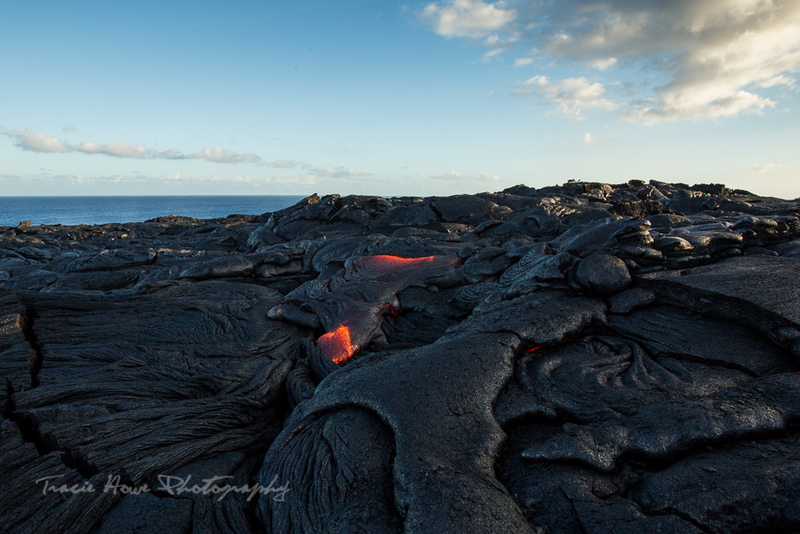 It was this perspective that showed me how easy it would be to access the lava flowing into the ocean. In fact, most of the journey to the lava was via a gravel road. When Kalapana Cultural Tours offered me a bike rental, I realized that biking would cut down my travel time almost in half. Biking on gravel is not especially easy, but it wasn’t too bad when you found the shallower paths to travel along. Biking to the lava was more desirable than spending valuable time walking, and breezy coasts down the little hills was a pleasant relief from the heat. Thanks to the bike ride, I rode for just over an hour and arrived at the lava about an hour before sunset. 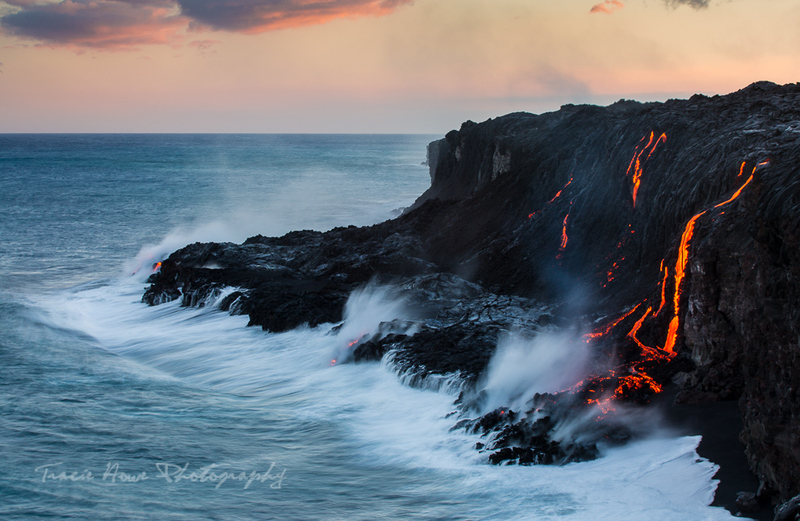 This gave me enough time to scout an area for photos by the water, explore the closer lava flows on the ground, and go back to my chosen spot for sunset. The active lava flow was roped off so that people wouldn’t stumble carelessly into it, but there were still areas further away form the ocean entry point where you could get pretty close. I followed closely behind people who seemed to be more courageous (or foolish) than me. I figured I would step where they stepped just to be safe. I was right to proceed with caution because the hot lava isn’t as obvious as you might expect. I had read that you might feel the heat before seeing the hot lava, but I didn’t really understand that until I felt it for myself. When I felt the extreme sudden heat, I looked for its source. Then sometimes I would see the red through a crack directly under my feet. The surface was hard and dry, but beneath was a flowing river! Super creepy. When I couldn’t find the heat source, that’s when I got a little nervous. I found a few spots with open streams of lava flowing along sluggishly nearby, and I was able to get as close as a few feet from them. It was pretty intense to feel the heat of the earth rolling gradually towards me. A very powerful experience to be so close to it! 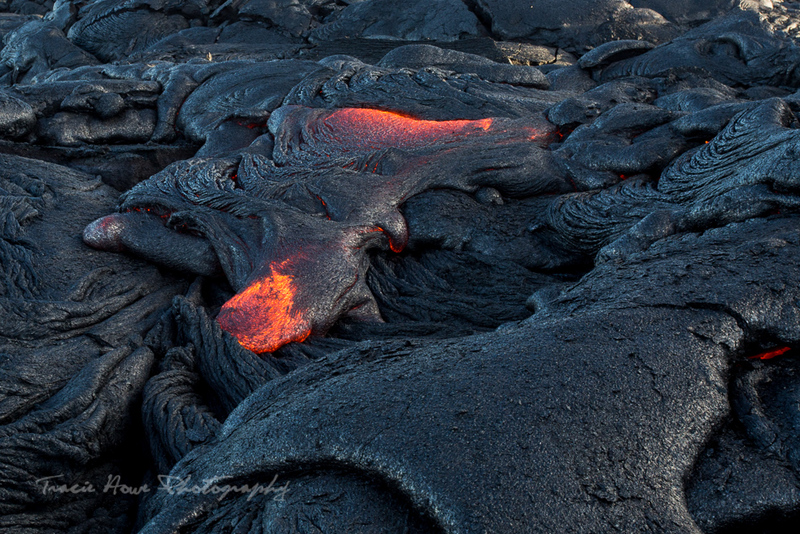 Patches of solid lava mingled with flowing lava. People picked their way along on solid paths in the background. Someone decided it was a good idea to burn a stick. I felt the heat from this crack before I saw the lava far below. Having spotted the heat source, I carefully stepped over the crack and continued on. I abandoned these closer lava flows with a bit of relief, knowing that the other side of the road where I had scouted would not be quite as treacherous. At least for me. I set up my tripod well away from most of the other tourists, many of which were too close to the fresher shelf of dried lava. 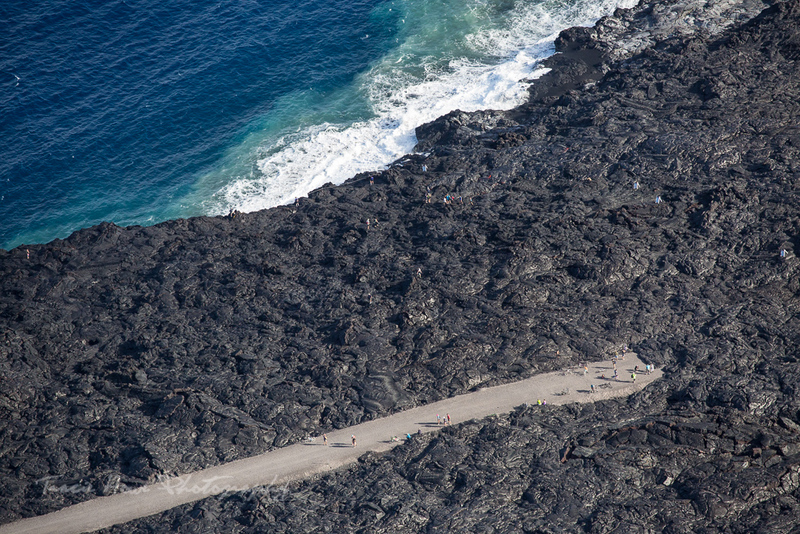 There are many risks present so close to the ocean lava entry. 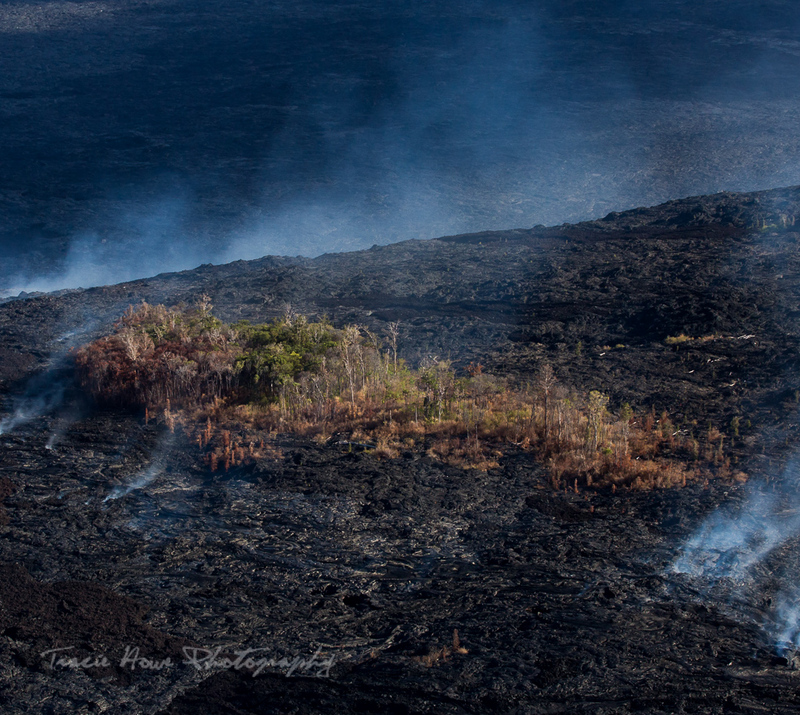 The gases arising from the steam are toxic, and the ground that close to the lava is still unstable. Not only this, but some people were perched precariously on the edge of the cliff that drops straight into the boiling ocean below. I saw a ranger constantly advising people to stay further back, but I guess some people are more willing to risk their lives for a photo than I am! See all those people? There was a guy teetering at an angle on the edge at one point. Just a really bad idea! Even though the other people were closer, several made their way back to where another photographer and I were set up. They claimed that this was a better spot, so I took comfort in that. Even without overhearing those comments, I was more than satisfied with my spot. Ecstatic in fact! There I was, only a few hundred feet away from the newly forming earth. 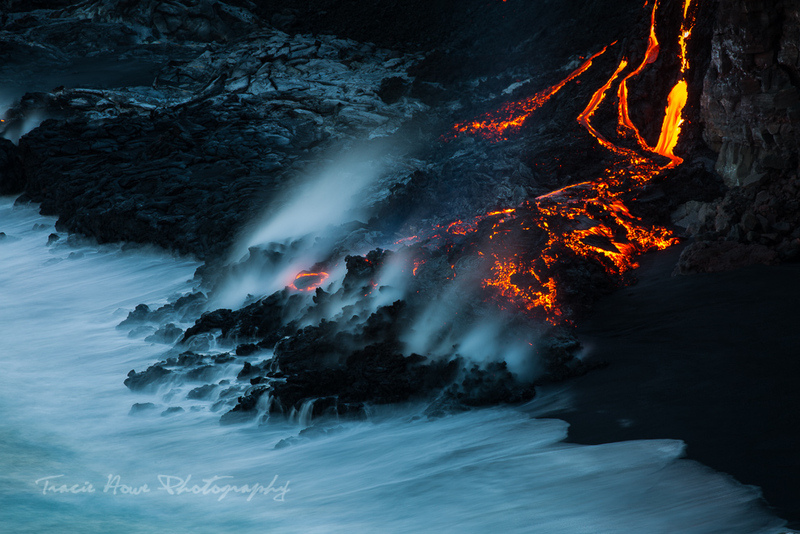 To see the lava dripping and tumbling into the ocean is an event that I will never forget. Eventually, it became too dark for anymore good photos, so I packed up and headed out. Well armed with a headlamp and gloves (in case I tripped on the sharp dried lava), I easily made the 5 minute hike back to the gravel road. It turned out that the bike ride back was more strenuous than on the way there, despite the air being much cooler. There seemed to be more hills in the opposite direction that I hadn’t really noticed on the way in. Had I not been loaded down with two lenses, a medium format DSLR, a tripod, and water, I may have had a much easier time of it. I still think biking was a better alternative than walking as it saved me so much extra time, and I’m thankful to have been given the opportunity. Alas, despite my best efforts I was unable to secure a lava tour by boat. Kalapana Cultural Tours was also going to provide me with a boat tour, but the weather forced them to cancel my trip. They did their best to try and reschedule me, but the timing never worked out. I’m thankful that the safety of their passengers was of the utmost concern. 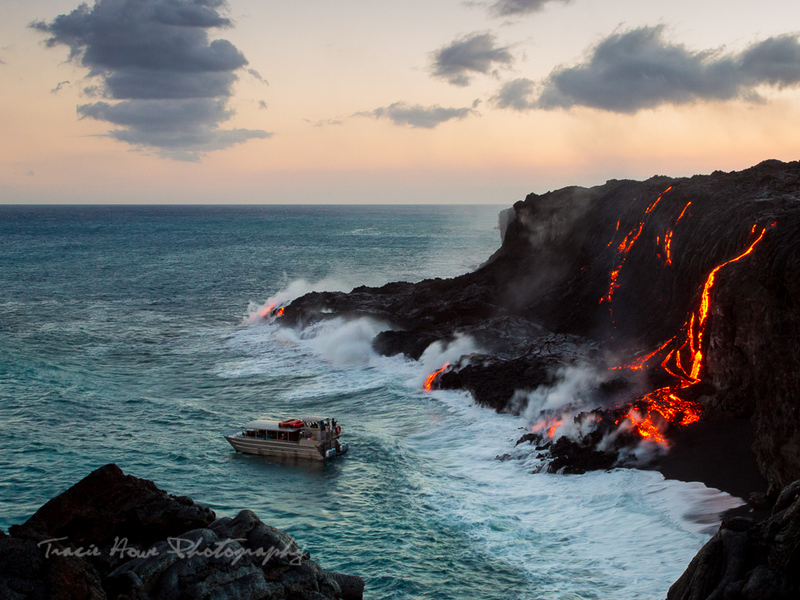 At my ocean side photo spot, I witnessed the boat of another company bouncing along briefly next to the lava flow. I imagined that I would probably be tossing my cookies if I were on a boat at that moment, so I was happy to be on solid ground. While I can’t speak from direct experience, I can tell you what I’ve heard about the lava boat tours. 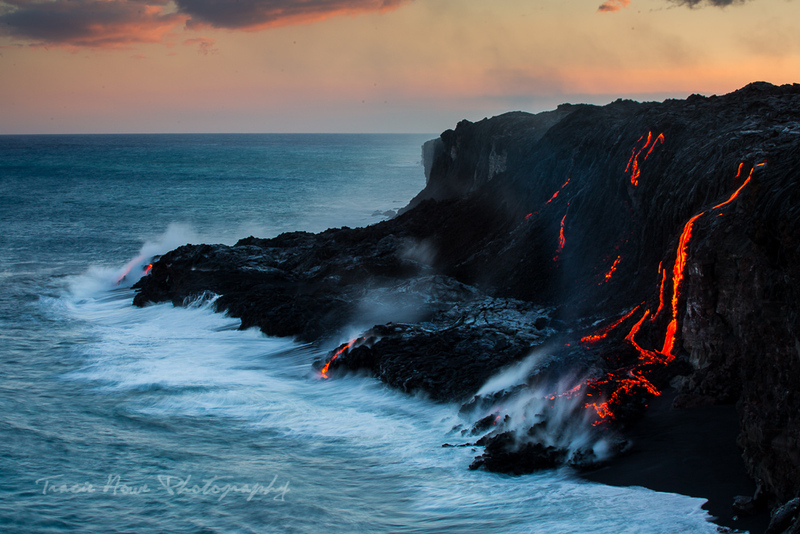 Sunrise is the best time to see the lava because the sea tends to be calmer and the light is beautiful. This early tour requires you to be ready to board before dawn, so be sure you stay close to the launching point. Having communicated and dealt with Kalapana Cultural Tours, I wouldn’t hesitate to recommend them for the boat tour. Previous to my experience with them, I had approached another company who I won’t name, but that exchange was frustrating to say the least. My love of volcanoes will surely bring me back to the Big Island again, and I intend to repeat as many of these activities as I can. If the lava is still entering the water, I’ll certainly try again for a boat tour, just to see the lava from yet another angle. Maybe by the time I’m back, there will be another place from which to see the lava. It’s always changing, so you never know! If you tend to get motion sickness and you plan to take a helicopter or boat tour, I don’t recommend taking any drugs. You’ll want to be alert, not sleepy. Skip the pills and opt for motion sickness bands. They can be found at drug stores or online, and they put pressure points on your wrists that do something to prevent motion sickness. They work wonders! If you’re taking a doors off helicopter flight, you will want to dress warmer than you might expect because it gets windy up there. I was perfectly comfortable with a long sleeve shirt and a hoody. You can’t wear hats or bandanas either, so plan for that. There are other ways you can approach the lava by land, though I won’t say much about them since I haven’t experienced them myself. 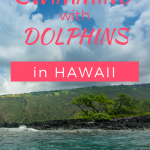 I contacted Kalapana Cultural Tours and they talked me through my options. You can take a guided hike with them, and you can also approach the ocean entry from the National Park. Just ask around and you will find your best option. If you take a bike out to see the lava, be sure to bring plenty of supplies with you. Take sunblock, two bottles of water, a strong headlamp if you ride back in the dark, and maybe gloves if you’re prone to clumsiness like me. Long pants are a good idea too, because if you do fall on the solid lava it will scrape you up! If I may be so bold, I’d also like to suggest bringing a little bell or something to warn people that you’re trying to pass them on the shallow gravel paths. If they move out of your way, you won’t be forced to cycle through the deeper gravel which slows you down to the point of stopping at times. This could save you a lot of effort! Please don’t be dumb! There is plenty of useful information on this site about the dangers of being around lava. Read it and consider yourself warned. On a doors off helicopter flight, you will be limited to bringing only a few things. No selfie sticks, no lens hoods, no switching lenses or filters. You must have straps for your camera, even if you plan to use your phone. If your helicopter has doors, you’ll want to dress in dark colors so as not to reflect onto the glass. For the best photos, I suggest bringing two cameras. Since you can’t switch lenses, bring one armed with your longest lens and one with a wider lens. You’ll want to avoid anything too wide, because you might end up catching one of the helicopter blades as you try to photograph the landscape. When you shoot, make sure you’re shooting as fast as possible. Don’t worry as much about the aperture. Focus more on the speed. I actually shot in Shutter Priority mode (Tv or S) so I could keep a consistently high shutter speed. You may need to bump up your ISO quite a bit to compensate for the extra speed. Take advantage of shooting with a digital camera and check your photos often. Make sure you’re getting sharp images with a good exposure, because you only have one chance at this! Whether you are at the ocean entry site or the National Park, arrive well before sunset to claim your spot. Next to the ocean entry, there aren’t many spots that are safe while providing a great view. I was lucky to be able to sneak in next to the other photographer. If you don’t get the perfect spot, please don’t risk falling in by setting up precariously on the edge or too near the unstable land. I recommend bringing both a long lens and a wide lens for this too. 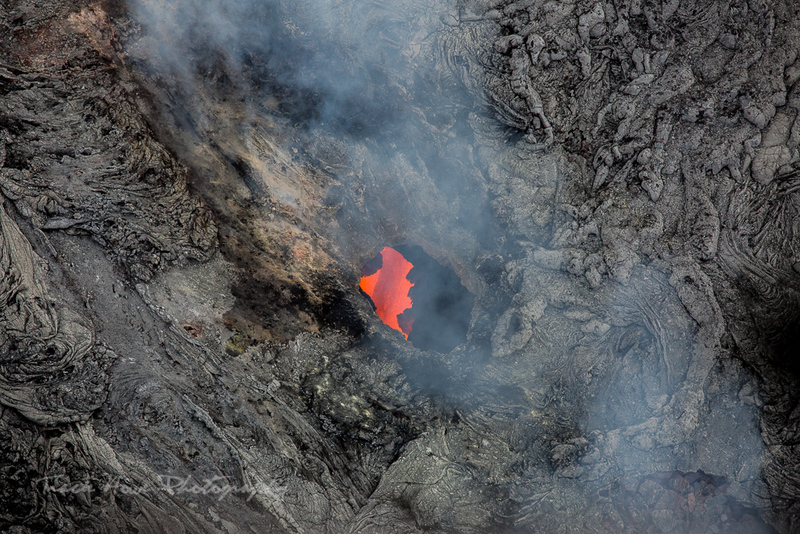 A long lens lets you get detail shots of the lava, depending on how close you are. It also allows you to zoom past all the people! A wider lens is nice for getting a sense of the entire scene. You’ll want to shoot from sunset on into dusk, so bring a tripod. Just be aware that you have to carry it all the way there if you’re going to the ocean! I encourage you to experiment with both short and long exposures, but it might just depend on what look you’re going for. The amount of wind blowing the steam around may impact your speed too, so be prepared to shoot fast with a high ISO in case you need to freeze the steam. *As always, all opinions and photos are my own and based on my experiences unless stated otherwise. 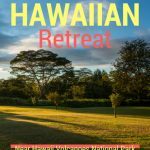 Paradise Helicopters and Kalapana Cultural Tours sponsored these activities, however I was not financially compensated for this post. A special thank you to the Hawaii Visitors and Convention Bureau for their assistance. I’ve seen quite a few volcanoes in my time, but never have I seen them enter the ocean.